So you’re driving around at night with no idea where you’re at, and your partner is having trouble reading the map? Obviously you haven’t heard of GPS navigation devices, so the next best thing is to flood the map with a light source, and what better way to do it than with the Seatbelt Light? Just clip it onto your seat belt and turn it on when you need to read a map or follow directions. Passengers can use it without distracting the driver. Two levels of brightness from 4 LED lights (included). Uses 3 AA batteries (not included). 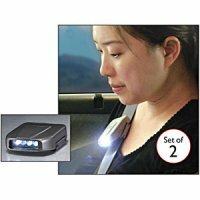 A set of two will retail for $14.99, although I’d say that using your car’s ceiling light ought to be good enough. Still, maybe you have a really old jalopy whose light has already expired a long while ago, making this little auto accessory a necessary purchase.